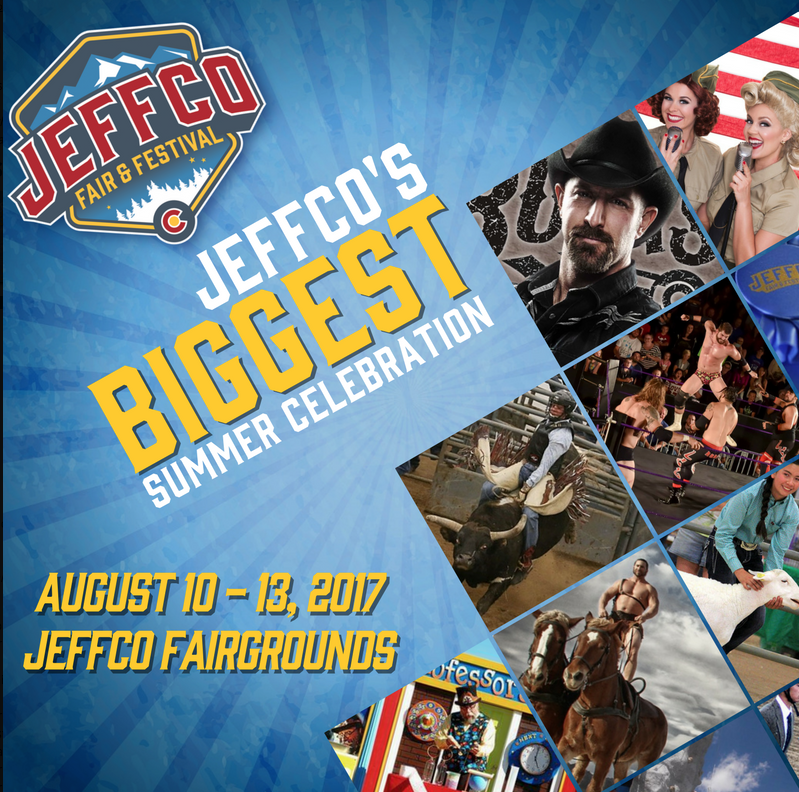 Join us in 2017 for the second annual Jeffco Fair & Festival in Golden, Colorado and Celebrate Jeffco with us! Lasting for 4 days, it’s Jeffco’s biggest celebration of the summer happening August 10 – 13. Mark your calendars now to join the celebration this summer at the second annual Jeffco Fair & Festival! “Event attendees will be immersed in exhibits and demonstrations from Jefferson County’s 4-H members and Jeffco residents. They will get their groove on at one of the region’s most diverse entertainment lineups, pull for their favorite cowboys and cowgirls at one of Colorado’s largest professional rodeos, and, of course, enjoy all of the other fun, interactive and traditional experiences that can only be found at Jeffco’s signature event,” said Dexter Foxworth, events coordinator for the Jefferson County Fairgrounds. 2016 was the inaugural year for the Jeffco Fair & Festival; a reimagined event that was built off previous fairs and festivals held throughout Jefferson County history. The first annual Jeffco Fair & Festival was held August 11 – 14, 2016 at the Jeffco Fairgrounds where event attendees were treated to a dash of fun, interactive, engaging and traditional experiences with a focus on locality to ensure there was something for everyone. Every day immerse yourself in exhibits and demonstrations from Jefferson County’s 4-H members and Jeffco residents, get your groove on with our outstanding entertainment lineup, pull for your favorite cowboys and cowgirls as they kick up dust at one of Colorado’s largest professional rodeos and of course enjoy all of the other fun, interactive and traditional experiences that can only be found at Jeffco’s signature event! This celebration has been designed and created thru community focus groups, surveys and many volunteers and committee members who live, work and play in Jeffco. Ensure success of an attractive, inviting and appealing annual County Fair and Celebration while supporting and showcasing 4-H, youth programs, equine, livestock and agricultural elements across the diverse communities of Jefferson County. Offer an annual County Fair and Celebration that educates, entertains, and invites community involvement and support while celebrating Jefferson County’s past, present and future through a financially responsible model.